Make it Monday April 8th. 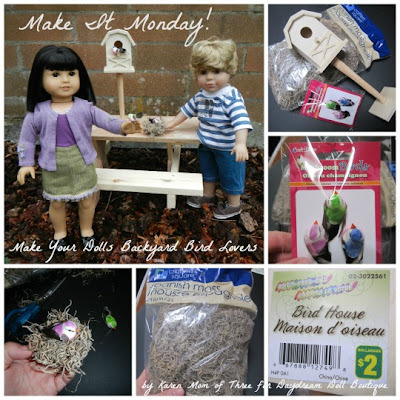 Make your dolls a Backyard Bird Lovers Play Set! Recently a new dollar store opened in my neighbourhood. I loved it! So many wonderful things to buy and repurpose into doll play items that fit with in with my doll play budget! 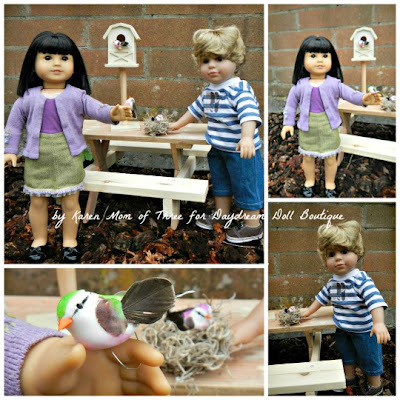 Step 1- If your bird house has a perch you can use one of the bird’s wires to create a loop that will allow your bird to sit on the perch and easily remove to sit on your dolls hand. The wires shown in the photo above on the back side of the package are really easy to bend. 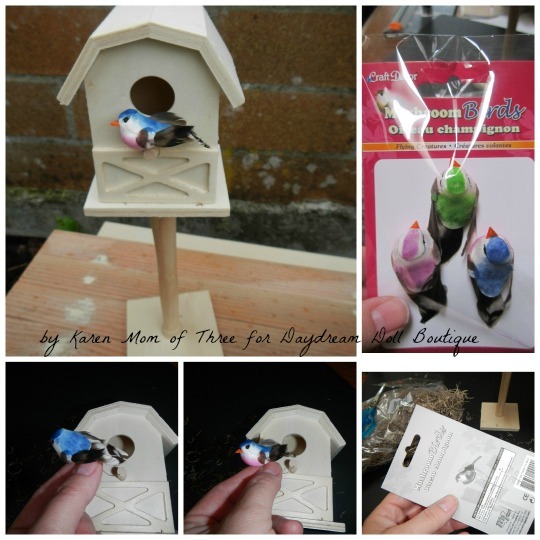 If your bird house does not have a perch use your glue gun to attach your bird to the house opening. 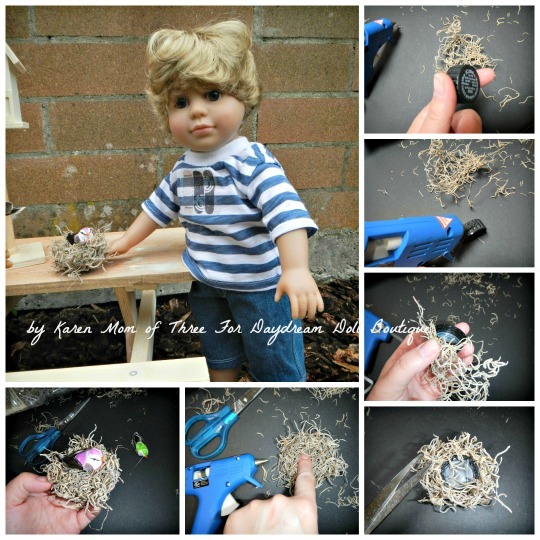 Step 2- To Create the birds nest you will need to heat up your glue gun. Add a line of glue on the edge of your soda lid. Carefully press in Spanish Moss along the edge, adding more glue and more moss as you go until you have the shape of a birds nest. Step 3- Use your scissors to trim the most if needed. Step 4- Add a dab of glue inside your soda lid and press in more moss to that it looks just like a real nest. Step 5- Bend the wire beneath the bird into a loop so that the bird can sit on your dolls hand or sit in the nest. This entire play set cost me less then $5 to create and makes a really fun dolly outdoor play set. I hope you enjoyed today’s post. Another great idea by Karen, I just love this one !